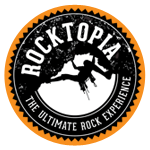 Just wanted to email you to show my appreciation for you and the Rocktopia teams hard work in running a great event yesterday. My students didn’t stop talking about it all the way home. I think many of them have been inspired to possibly take the sport a little more seriously. I have been part of various climbing events round the world and this was one of the best organised and enjoyable. Thank you and please don’t hesitate to email me if you guys need a volunteer or something in the near future. We took our 6 & 11yr old girls yesterday for her birthday & right from the check in we had the most superb service from the lady at reception, wish I got her name! She was super nice & helpful & made a fuss of the birthday girl. The instructor was amazing also so good at his job, lots of fun & really encouraged my girl to do the leap of faith!! Omgosh so cool to watch & the 'big' boys loved the vertical slide. Such a great day was the best service & fun we had the whole time we stated in the BOP!! Will definitely visit back again. Thank you ? Wow I love the make over and the kids had a blast this afternoon at clip n climb. Everything looks soo good now and we can't wait to try the climbing walls as well. I wish that I bought a voucher too. It looked like so much fun. Our daughter was quite timid to start with but she was gaining more confidence every step of the way. Special thanks to the very attentive and enthusiastic staff. They were absolutely fantastic. We bought a new voucher straight after. We will be back. I have taken my 3 and 5 year old here twice now and we can't wait to go back again! The staff are absolutely amazing and friendly! They totally add to the experience! Positive, helpful and encouraging! A very cool, active and fun filled hour! Great place! Our 6yr old boy had a great time he was a little bit worried at the start but Doug and Faith were super awesome! They took their time guiding him and building his confidence up. He loved it so much we might be back there tomorrow! Had a fantastic time at clip and climb today with 4 kids and 2 mums!! Thank you so much, the staff were excellent ! Super encouraging to my son who was stuck on the last step of the pillars for a little while, but you talked him through it , and we are so so proud! Thank you ! Went in for a quick look and stayed..daughter loved it! and ill be trying it all next time. The Staff are all helpful and friendly!!!!!!!! If you haven't been then go. This was awesome fun for my boy, great staff and really cool walls. Someone has put a lot of thought into this and it's amazing. Well done guys!! Make over is awesome, Clip n Climb addition is tops, and the staff are super friendly and helpful! Highly recommend! Highly recommend! Loved our experience there today and especially the 2 girls who worked there. Super efficient, supportive and friendly � thank you so much! Awesome. What a great place to bring the family. Something for everyone. Coffee was great too. Thanks Carla and co. The kids had a great time at clip n climb, plenty of challenges for them, and great coffee for me. And then a social Thursday evening of quality climbing on nicely set routes for my night out. What a cool set up. Safe and exciting for the kids...plenty of wall options, plus the leap of faith to challenge the braver ones. Awesome. Thanks heaps. We had our daughters birthday here today and it was fantastic. Kids had such a cool time.Great helpful friendly staff,so nice and clean. Went with a school trip for my daughter. Great place and great staff. Professional, friendly staff and an immaculate facility! We had a great time, will most definitely be back - probably next week! Great place to visit - kids looking forward to coming again. Lovely café area too. Awesome place the kids loved it has heaps of fun and very helpful staff. We will be back very soon! Awesome! What a great place to visit on a rainy, or not so rainy, day. Well done guys on a great addition to the Mount! Awesome gym. Awesome people. Walls are calling and you must go. Great place, good atmosphere, nice people, interesting routes. Support! Great fun for the whole fam from my 2yo up. Best thing ever! Great space - heaps of fun for the kids! A totally brilliant place to take the kids! Had a blast meeting the crew and doing the vertical drop today 😀 !! Looking forward to a chicks rock night!